You need to first lift your entire head to a consistent level 10. So be sure to check your hair and assess how many levels you need to lift. Depending on how much hair needs to be lifted, open one or two sachets into a mixing bowl. Now add in your developer. If using one sachet, pour in 100 ml (3.5 oz) of developer. If using 2 sachets, pour in 200 ml (7 oz) of developer. Mix really well using a non-metallic spoon or whisk until you have a nice, smooth paste. Section your hair, starting from the back, and apply generously throughout. Work fast - the bleach mixture needs to be applied when wet. Keep the root part until the last - this is the part that will lift the fastest and the most. Check to make sure that all parts of the hair are lifting well. If you see parts that are drying out or not lifting, be prepared to add in some more mix. Rinse when the hair has been fully lifted to a consistent level 10. Get 2 bowls. 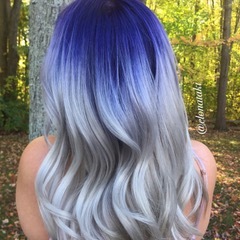 Into one, squeeze in 2 parts of blue and 1 part violet. You will probably not need more than one full tube of color in all. Pour in 3.5 oz of your developer (1:1 mix) and mix thoroughly. Apply on the root area, sectioning finely. Aim to get great product saturation. 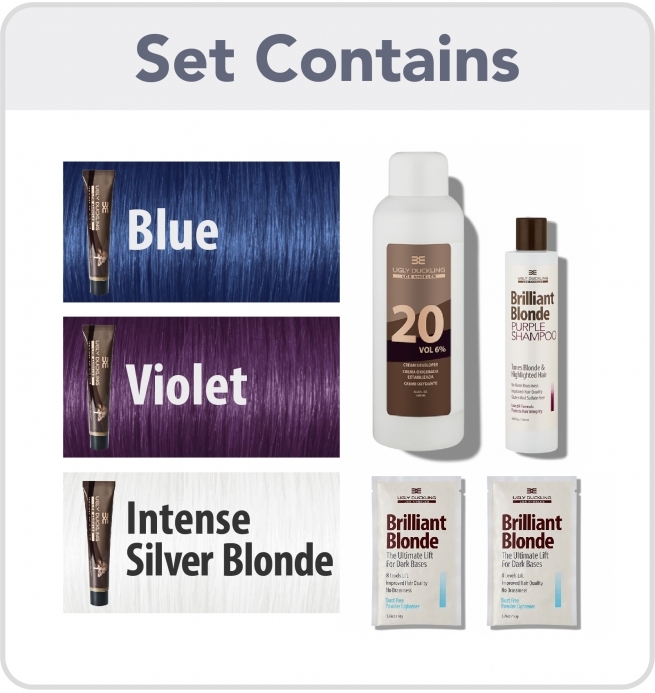 This is what will give you a rich, vibrant color. If necessary, you can apply a second time. Now, in your second bowl, squeeze in your Intense Silver Blonde Toner. Use the full tube. Pour in 7 oz of developer (1:2 mix) and mix thoroughly. Apply on the lengths using a fresh, clean brush. Taper nicely between the shadow root area and the lengths. Process for 20 minutes after finishing the lengths. (This should mean that the roots have processed for around 30 minutes). Rinse first with water. When doing so, don't rub the hair, otherwise color will run from the roots into the lengths. When the product has run out, you can wash thoroughly with purple shampoo. This will give a final toning to the hair as well as close the cuticle. 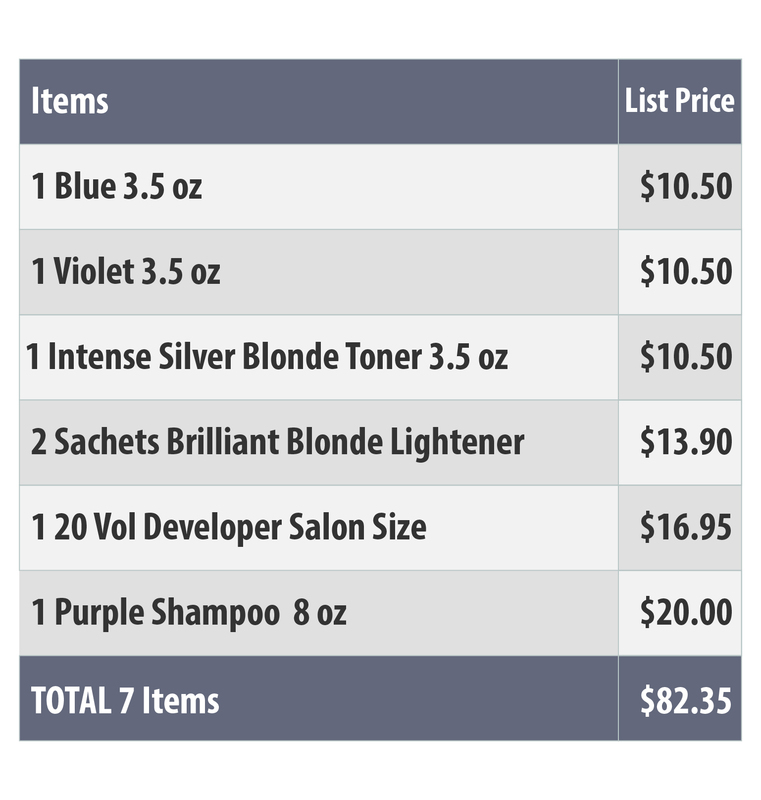 Use the purple shampoo to keep your hair white and ashy. 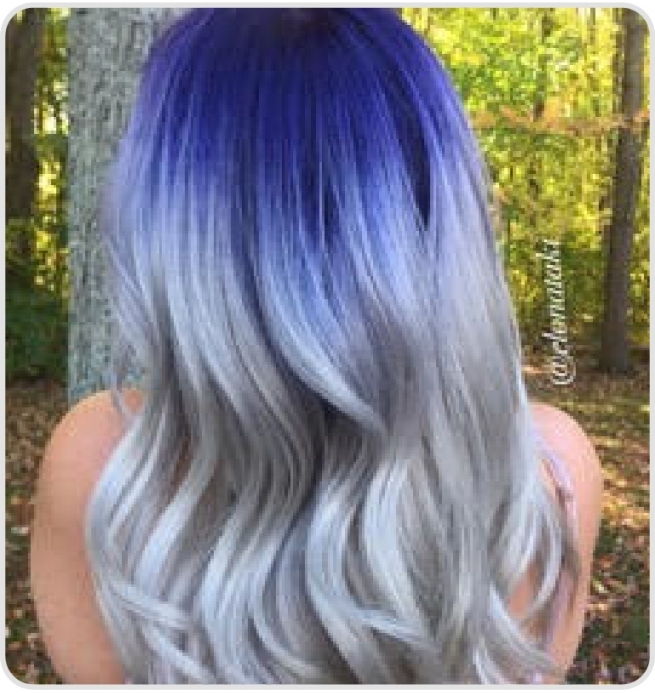 Do a Blue Silver Shadow Root Today! 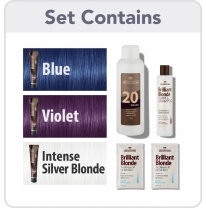 The set contains enough products even for very long hair. You should have plenty of product left over (especially developer & purple shampoo) for future retouch applications and for maintaining your look. You should have plenty of product left over (especially developer & purple shampoo) for future retouch applications and for maintaining your look. You need to first lift your entire head to a consistent level 10. So be sure to check your hair and assess how many levels you need to lift. Get 2 bowls. Into one, squeeze in 2 parts of blue and 1 part violet. You will probably not need more than one full tube of color in all. Rinse first with water. When doing so, don't rub the hair, otherwise color will run from the roots into the lengths.